It was cloudy and rainy today and I wanted soup. Vegetarian tortilla soup specifically. Though this soup may be vegetarian don’t let that scare you away. It has all the flavor of the real thing. The ingredient list looks long, but most of its spices. Which is why it tastes like the real thing. It took me about half an hour to throw this meal together even with stopping frequently to taste and add things. So I know you’ll be able to knock it out in no time. If you want a vegan version you know what to do about garnish changes. 1. In a large pot heat the cumin until fragrant over medium high heat. Stir in the oil and add the frozen peppers and onions. Season with salt and pepper. Turn heat to high and cook until vegetables are softened and fragrant. About 5 minutes. Add minced garlic and cook for another minute. 2. Add the crushed tomatoes, mild chopped green chile peppers, water, Celifibr Chicken Bouillon Poulet cubes, paprika, chili powder, garlic powder, onion powder, dried oregano and coriander. Bring to a high simmer and cook for 10 minutes or until heated through. 3. Add the corn and beans and cook for 5 more minutes. Season with salt and pepper to taste. Ladle into bowls and garnish as desired. Sounds delicious and comforting! I love Tortilla soup, vegan or not! This makes me smile. 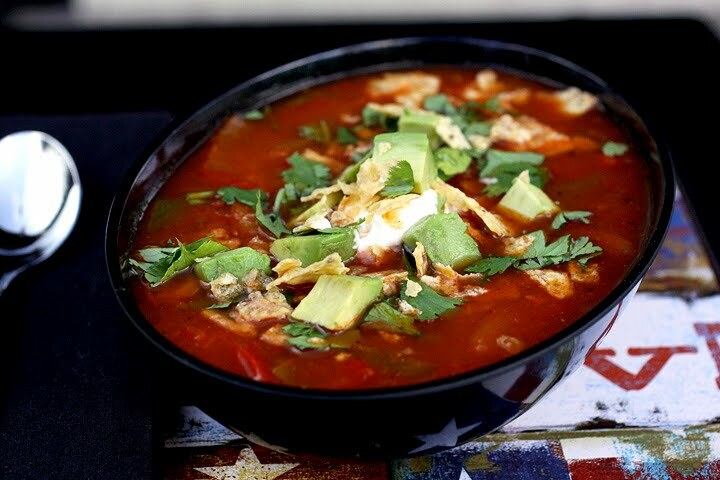 I grew up in Houston, where we would eat Chicken Tortilla soup on a weekly basis. I've been wanting to make a veggie adaptation for some time, and now I have a great recipe to go to. Thanks! Love this! Especially since soup is on the top of my LOVE list! I love tortilla soup! I haven't had it for the longest time since I haven't been eating meat lately. Thanks for the veggie version - it sounds spicy and delicious! This soup looks so good to me right now. I bookmarked the recipe already. Thanks for doing the spice guesswork for us! This sounds lovely. I'll be craving soup as soon as it cools down a bit, but in our 100+ heat wave I just don't want to use anything in the kitchen haha. This looks delicious. We love soup all year round-and I'm with Cyndy-I wouldn't miss the meat at all. I was just thinking of making a summery soup! This looks wonderful. This was awesomeeeee! I want to make it, and maybe add more beans to it? I always add lentils to my chili and mexican-style soups and stews - particularly these seasoned ones from Tasty Bite called Madras Lentils. Their smokiness is perfect for this kind of cuisine. I definitely recommend trying this as well as checking out their other stuff - all of it is vegetarian and a lot of it is vegan. Thanks for the awesome recipe idea and bon appetit! Now, this looks good. Delicious. Fast and healthy too. Laura> your photos are beautiful as always, the soup is a positively magical color. just a note on your comment on my blog (thanks, btw, from as fine a photographer as yourself) foodgawker wouldn't take the best photo... too dark they said... go figure!!! Love tortilla soup and your photos are so beautiful, like always! Never had tortilla soup! Yours looks so lovely. I've never had tortilla soup but it looks very good. I made some homemade tortillas a few months back. I would like to try this one. A soup recipe! I have a hard time imagining when I will want soup again (it is hot and humid in New York right now), but when I do I am coming back to this page. Looks delicious. I'm always looking for a good vegetarian soup with lots of flavor. I enjoy soups year round so I'm not put off by warm days. This looks delish, and I love the toppings. West or South - its always raining in Scotland. This tortilla soup would be very welcomed, especially as I'm vegetarian too. Thank you so much for sharing. Yay! Thanks so much for sharing the Tortilla Soup love with me =) I'll be posting the next roundup towards the beginning of October! It makes about 5 to 6 good size portions.